AMERICANAFEST ALERT: Olivia will be at the week-long conference and will be seen at the Select-O-Hits booth in the exhibit hall during the day. In an age where the dominance of digital downloading and streaming leads most emerging artists to play it safe and release only single tracks and short EPs, Olivia Kellman transcends the trend, blazing fresh and inspiring trails with the release of her expansive full-length debut On My Way. Over the course of 13 tracks that effortlessly mix confessional, coming of age acoustic grace with edgy and hip funky indie-pop energy, the multi-talented Chicago based performer fulfills her lifelong dreams of making music. Olivia’s willingness to be vulnerable, and her boldness in sharing the heartfelt, multi-faceted stories of her life, will no doubt open doors for indie artists to stop limiting themselves and share the fullness of their life experiences and hard-won wisdom with the world. While the focal single of On My Way is “Come Back Down,” a whimsical reflection on the freedom of being young, when “there was no gravity to pull us in,”– and her desire to break free from life in the margins. “Do You Know What It’s Like” was the first song she wrote for a project while attending college. 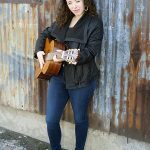 She had been crafting tunes in her head for years, but taking an extracurricular guitar class and learning to compose on acoustic guitar was the key to her breakthrough as a songwriter. One of the most dynamic aspects of the emotional roller coaster Olivia commands as she takes us on the journey is how artfully she balances humility and gratitude (the title track, dedicated to her ever-supportive parents) and kind encouragement (“Good Morning Beautiful,” which concludes with the line “What a beautiful thing it is to be yourself and no one else”) with edgier tunes calling out a “Hypocrite” and struggling to accept her break the mold reality as a “Rebel Child.” The singer reveals an even deeper artistry and personal strength in overcoming struggles on gems like the post-romantic split tune “Unbreakable,” the soulful anti-bullying anthem “You’re Not Invisible” and the socially conscious anthem “Voices Need Sound,” which she wrote in the wake of the outcry to the police shooting and resulting riots in Ferguson, Missouri in August 2014. In “Voices Need Sound,” Olivia addresses the reality that there are “Two sides to every story/Only one gets the glory/While the others in despair.” She reflects on “Marches in the street/Drummers add a beat/Just wanting to be heard.” Reflecting on her inspiration for this empowering song, she says, “While I wrote it in response to Ferguson, I also started thinking about people trapped in cycles of oppression. It’s a song for the voiceless, those who don’t have the opportunity or power to speak up. I drew on my own experience growing up with a learning disability and who has been bullied. Everyone is trying to silence these voices and they deserve to be heard. Growing up as the daughter of a veteran music manager (whose clients, among others, were Minnie Riperton and Dave Mason) meant that Olivia was exposed to all kinds of music and a 70’s and 80’s CD collection. She also recalls her grandfather always singing Frank Sinatra’s “My Way.” Though she is influenced by iconic singer-songwriters, soul and jazz, and she’s been favorably compared to Carole King and Stevie Nicks. Natasha Bedingfield’s “Unwritten” anthem was Olivia’s life mantra that always comforted her and was her go-to belt song at karaoke for years. While Olivia shares 13 powerful slices of her life, heart and soul via On My Way, she makes it clear that music is only one aspect of who she is. There are always things about herself she hides, the same way she didn’t tell people about her disability for several years after she was diagnosed. Singing helps her get back to those places she has found difficult to share. Olivia captures a little of this – where else? – in song, with a few lines from “Rebel Child”: “I’m a bit ambitious/Live with no restrictions/But I’m not relentless/Just unexpected.” With the singer’s rise as an indie artist, she will face many fresh expectations – but that sense of the unexpected is what will keep us listening… and coming back again and again to experience more of her musical and life adventures.